This "Ginger Orange" is described by Chef Gand as infusing her recipe with classic ingredients from East Asian cooking, "layering savory atop citrus with a ginger bite for a distinct, singular flavor". Grass fed beef, tamari sauce, cane sugar, ginger, granulated garlic, orange peel, granulated onion, sesame seeds, cayenne pepper. The first thing I pick up on my palate is a beefy flavor with a light citrusy orange. I can pick up a faint ginger. 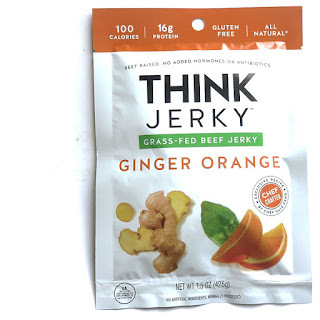 The chewing brings on more of an orange zest with a sharper ginger. I can also detect a weak spicy heat and touches of onion. For being marketed as "Ginger Orange" it seems to hold up well. The orange has more of a citrus tang and zesty orange peel, while the ginger is well noticeable with touches of its natural heat. There's a bit of heat in this, which feels mild to me, but I think is just enough to warrant, "mild medium" on my personal heat scale (level 2 out of 5). 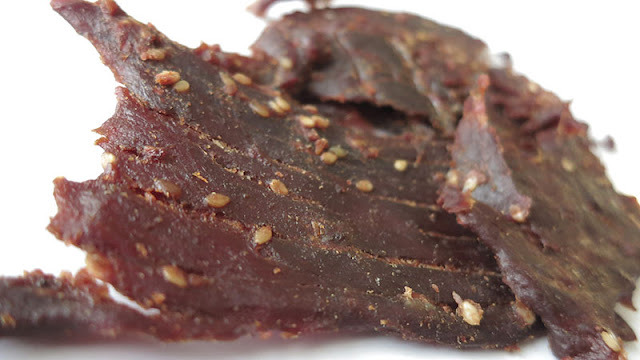 Otherwise, the primary taste profile is a "beefy" flavor, which might be better compared to a beef broth with some actual natural meat flavor. The citrusy tang and orange zest, along with the sharp ginger make significant additions to the flavor. There's a light bit of onion seasoning rounding things out. The meat consistency looks good in that I see mostly all meat, with little fat or stringiness. The chewing starts out dry, yet tender, but becomes mushy after several chews. It doesn't really have a meaty, or steak-like feel. This Ginger Orange beef jerky from Think Jerky definitely delivers on a combination of tangy orange contrasted with sharp ginger to created a lively flavor over a beefy, onion-seasoning. 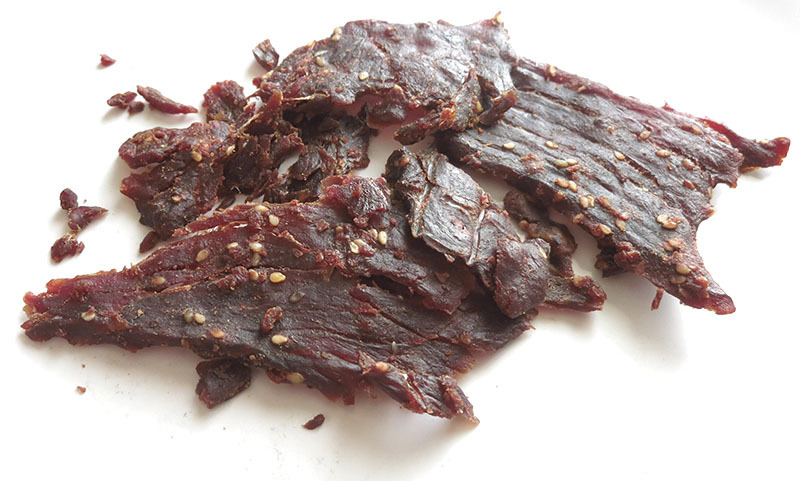 It hits all areas of the tongue from sweet, spicy, savory, tangy, pungent, yet lightly salty. While the meat consitency is good, and the chewing tender, it tended to chew mushy and not really resemble the texture of natural beef. Overall, an exciting, protein-packed snack that caters to a health-concsious, active lifestyle.